Guest speaker Diane Rehm and American University President Emeritus Neil Kerwin at Olli's 35th anniversary luncheon. For 35 years, the Osher Lifelong Learning Institute (OLLI) at American University has offered lectures, classes, and educational events for older adults across the Washington area. 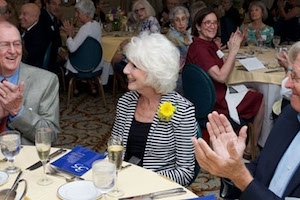 OLLI recently celebrated this milestone with a luncheon for more than 200 guests, including American University President Emeritus Neil Kerwin and guest speaker Diane Rehm, the former host of NPR's The Diane Rehm Show. In his opening remarks at the luncheon, Kerwin discussed the long partnership between American University and OLLI and how the organization has grown since its founding in 1982 with less than 100 members. OLLI at AU now offers more than 90 courses to 1,200 members. "That's the size of a small college, and you will continue to grow because the quality of your program is so strong," Kerwin said. "It's been a delight for me personally to be involved in it. I hope that I'm invited back at some point to lecture again. I would be more than happy to do that." OLLI is an independent, nonprofit organization and part of the Osher Lifelong Learning Institute National Network, which includes 119 institutes across the country. In its partnership with AU, OLLI leases space at the university's new education building on Massachusetts Ave and draws on the expertise of the university's faculty members. Its members also use AU's facilities, including the university library and computers. OLLI was founded on the principle of learning as a lifelong process, as a place "where curiosity never retires." The organization operates like a small liberal arts college, offering lectures and courses led by its members and AU faculty. Members can also participate in study groups, either by leading them or attending them. There are no tests and no grades; members participate purely for the joy of learning. They can choose from far-ranging topics including Peace in the Middle East, The Poems of Billy Collins, Neuroscience and Visual Arts, Mindful Meditation, and many more. OLLI AU's founder (and AU alumna) Tina Fried Heller believes that an energized, intellectually vigorous older population involved in learning adds to the health of any community. "We know that engaged, active members attending classes and lectures and making new friends, find much to offset the ennui of retirement," said Fried Heller. "As we have grown to more than 1,000 enthusiastic and committed members, we are confident in the success of OLLI as a real asset to the community and to individual lives." AU Music Program Chair and Professorial Lecturer Nancy Jo Snider agrees. She has taught several music courses to OLLI members. "OLLI members are the ideal students; they want to be there and are eager to learn," she says. "They are vastly intelligent, extremely accomplished, and about the nicest people one would ever want to share a class with. It is always a sincere pleasure to work with the terrific OLLI leadership, staff, and members on realizing their very positive mission." When Fried Heller first began thinking about forming a lifelong learning program in 1980, she quickly realized that nothing like it existed in the DC area. In fact, she could only find three in the nation. Yet Fried Heller was convinced that many people in DC were eager to continue learning during their retirement years. She worked with Carolyn Alper (AU alumna and founder of AU's Alper Initiative of Art), and Jack Blum (AU OLLI's first chair) to pull together a proposal and organizational outline for funding a volunteer, membership organization with intellectually stimulating peer-led study groups. "This all began 35 years ago, and look at us now," she said. "Society has changed in these past decades. No notions of rocking chairs or fishing poles are attached to the term retired. We know how vital and energetic a group we are. Happy birthday to us." Fried Heller looks forward to continued growth in the AU-OLLI partnership. "It is AU that welcomed us 35 years ago with our fledgling ideas of creating a lifelong learning membership organization," she said. "The ensuing relationship has strengthened as we have grown and interactions with faculty and campus leaders have increased. We look forward to continuing this partnership far into the future."